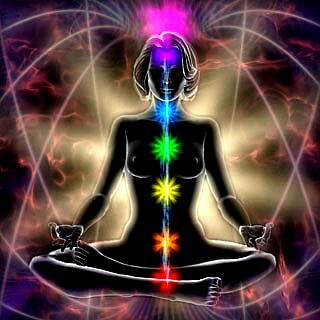 CHAKRAS are energy centres in the etheric or subtle body they activate the aura or life force. When these centres are activated the life force is in harmony. “Chakra means wheel in Sanskrit”. There are seven sacred/psychic centres. These seven Chakras Correspond to the etheric energy channel parallel to the spinal cord. The seventh crown chakra is located above the brain. Although not seen by most people they are usually felt in and around Auric field. Most psychics and healers can see this emanation. The root chakra is located at the base of the spine and the colour emanation is red. This red energy centre is often seen in the shape of a spoked wheel and is associated with the reproductive organs; the musical note corresponds to C The musical note is doe. violence, anger, constipation, survival fears. The spleen chakra is located just below the naval and to the left of the stomach. The colour emanation is orange and relates to the adrenal glands. The musical note is D and the sound wave is Ray. The orange energy centre is a flower shape containing three petals. This chakra is associated with and to the quantity of sexual energy of a person. With this centre open a person feels their sexual power. weak and disappointing. On another level this centre is associated with positive will, strong intellect and mental clarity. Any blockage in this area will also manifest in confusion and lack of self -belief. consciousness of universality of life, who you are within the universe. The solar plexus is where we tune in and psychics often develop a paunch there to protect that area. Any blockage in this area can result in poor self-image. Sometimes called “the lotus- shape” the number of points of crystalline structure dependant upon the strength of this centre. It is the chakra of love and the mid point between heaven and earth. The musical note is F and the sound wave is far. The heart is associated with love growth and prosperity. Any blockage here will result in isolation and loneliness. electric blue the musical note is G and the sound wave is SO. pineal gland. The colour emanation is indigo; the indigo centre is a quieter centre, which has the basic triangular or three- petalled shape in many, although some adepts who have balanced the lower energies may create more faceted forms. The musical note is A and the sound wave is LA. This is the chakra of communication psychic ability and mediumship. The crown chakra is located on the top of the head near the area of the soft spot when you were a baby. The colour emanation is red violet, the musical note is B and the sound wave is TI. This is the chakra associated with inrush of spiritual power, enlightenment oneness, and satori, Samadhi.